I met Melanie [left] and Annie [right], daughter and mother, while strolling through the Fullerton Arboretum — CSUF campus, Fullerton, CA. Annie is from the Seattle, Washington area and traveled to Southern California to visit her daughter. Melanie lives near the arboretum. Annie had been an avid gardener, but currently doesn’t have a garden to tend. When traveling, she really likes to see what type of plants grow in different regions and thinks the cactus garden we were standing in, is really amazing. 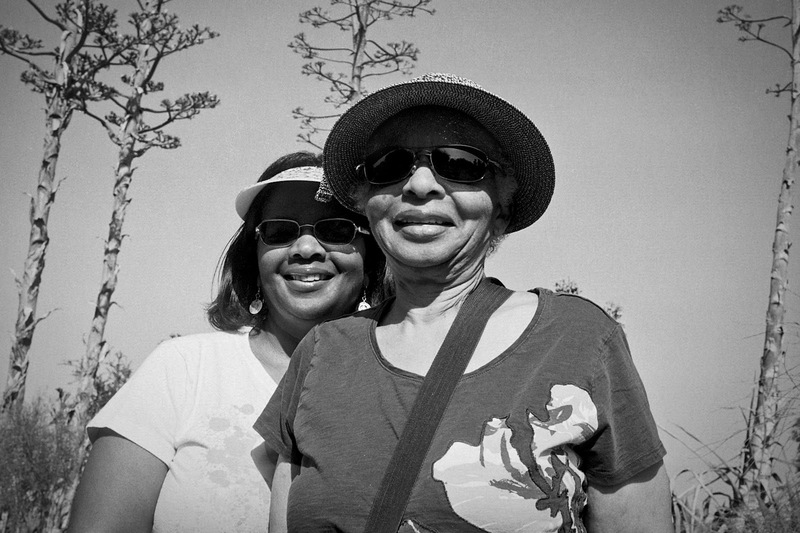 Melanie said that she and her mom really enjoy nature and having the arboretum within driving distance was a great way to get out and enjoy the outdoors without leaving the city. A note about the 100 Strangers project. I have no idea if other participants would consider two people in one shot to be two down in the count to 100, but I will not be doing so. I'm in no hurry to get to number 100 and would rather count one photograph, no matter how many people are packed into the photograph, as one entry in the series. If you would like to know more about the 100 Strangers project, go here. Annie and Melanie, much thanks to the two of you and your patience. I really enjoyed talking to you both. I hope the rest of your day at the arboretum was grand. This image was shot using a Walz 28, 35mm rangefinder camera using Ilford XP2 Super 400 film.